Compact glasswasher: with an installation height of only 705 mm ideal for narrow places or with integrated reverse osmosis and an installation height of 820 mm ideal for undercounter installation. VISIOTRONIC-TOUCH control: colour touchscreen (displays text and graphic) in conjunction with singlebutton control and remaining cycle time indication. WASHSMART app: controlling your warewash operation with smart technology: status and messages, usage and operating costs, hygiene, service and consumables order. 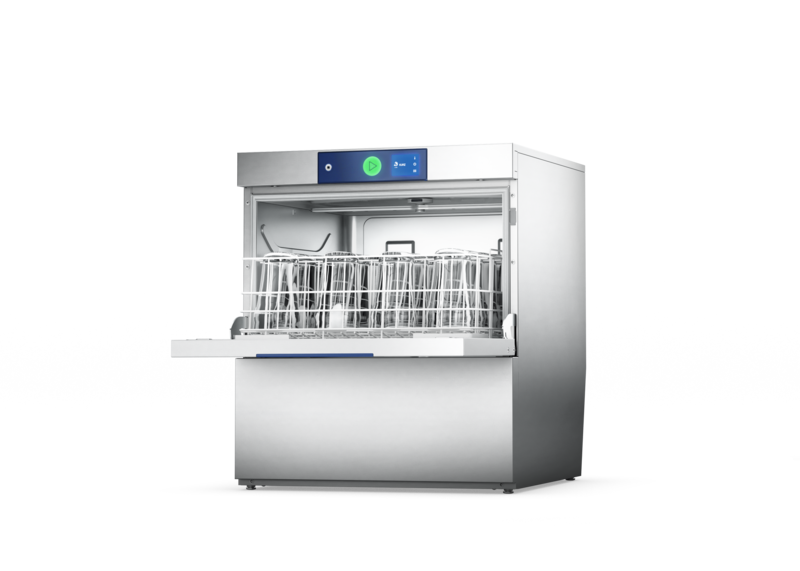 SENSO-ACTIVE resource management: constantly measures the quality of the wash water and keeps the amount of rinsing needed in each rinse cycle to the minimum in order to guarantee a fully hygienic wash result. CLIP-IN wash and rinse arms: can be removed with one hand and without any tools. Intelligent data documentation: automatic recording of important operational data and consumptions and indication on the display. USB-interface: comfortable download of operational data in form of a protocol via USB. GENIUS-X² fine filter system: advanced filter system with prewash function reduces detergent consumption up to 35 %. Cold rinsing: the rinse can be switched from hot to cold water so that you get cooler glasses without any loss of time. Intensive programme: intensive rinse cycle to wash glasses with critical design with raised fresh-water amount. Interlocked strainer: prevents operation without tank strainer. Optional refill signal: monitors contents of external as well as integrated chemical containers. Hygiene programme: for removal of calcium carbonate and other deposit from wash chamber. *Thermostop guarantees required temperatures with cold water and / or 230 V connection, the actual cycle times extend accordingly. For machine protection the water hardness should not exceed 3°dH, if higher we recommend using an integrated water softener or an external water softener of the product line HYDROLINE PROTECT. To avoid spots and streaks on the wash ware, we recommend the usage of an demineralisation cartridge (HYDROLINE STAR / STAR EXTRA) or a reverse osmosis system HYDROLINE PURE.